In American Gulag Archipelago Panderbear left the reader with the question, "Why are U.S. incarceration rates the highest in the world?" It turns out determining the proximate cause of this anomaly is pretty easy. A Wikipedia chart of the percentage of incarcerated Americans from 1920 to 2008 shows that the current world record U.S. incarceration rate was not always so. Today's rate is more than 4 times what it was before President Nixon declared the "War on Drugs." 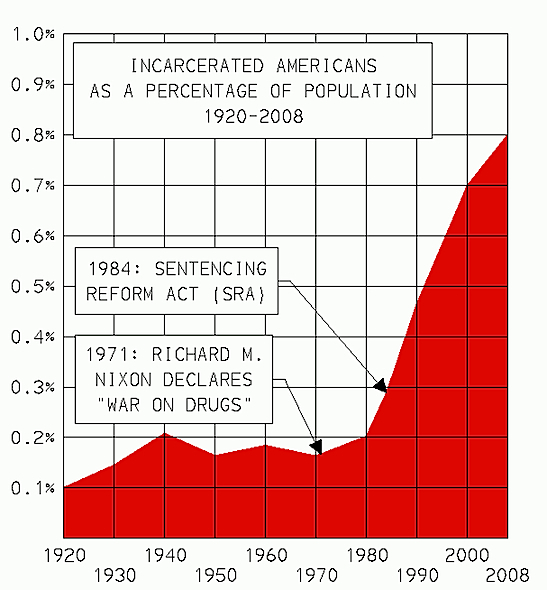 This failed war ignited a conflagration of incarceration and the 1984 "Sentencing Reform Act" (SRA) acted as accelerant. A futile War on Drugs, spurred on by "tough on crime" political panderers has let to the imprisonment of millions of Americans and long sentences prescribed by the SRA has led to an overflowing and aging prison population. The more recent advent of private enterprise prisons with their newfound lobbying might, ensures Congress has no appetite for prison reform or reform of the criminal justice system and sentencing guidelines. Now prisons are big business and Congress is nothing if not pro-corporation. A corporation's incentive is always to maximize profit and that means maximizing the prison population. It is not lost on Panderbear that a black man is 7 times more likely to go to prison than a white man. If that ratio were 1:1 instead of 7:1, would SRA sentences be as harsh as they are? Would there not by now be a hew and cry from the masses of Americans and their government representatives for rational prison and sentencing reform? Would there have been an SRA at all? Panderbear finds these questions profoundly troubling. Perhaps a more apt description of this situation than American Gulag is American Apartheid. Just LOVE your columns! And Groucho quotes. Just discovered you--will read all of your writing. Thank you. Thanks. You just made Panderbear's day. Thanks.BTW I found a lot of your other columns on social security and budget issues equally fascinating! Thanks for your reply and the excellent and interesting questions. As time permits I will try to address them in future posts. I confess I didn't research the precise meaning of the term "correction supervision" but took it to include people on parole who must check in periodically with parole officers, those under house arrest, and those wearing ankle bracelets monitoring their whereabouts.